Are you frustrated that laps around the track haven’t helped you run a faster 10K? You’re not alone. I can’t explain why, but some people just can’t get faster with track workouts. If you’re one of those people, or if you need to get fast while mostly using a treadmill—this column is for you. There are a couple of key workouts that make a difference when aiming to run a faster 10K. The first workout I like is the short interval, hilly treadmill session I wrote about awhile back. This workout improves speed by recruiting more muscle fibers (all hill running does this), then turning that into greater leg speed with a flat run at the end of the workout. This is all accomplished at a low metabolic cost. What do I mean by “low metabolic cost?” I mean that you could do this workout once per week, year-round, and if done correctly it won’t leave you feeling trashed for days. That statement can’t be made for threshold, track or long run workouts. If you want to mix it up and do the hill workout outdoors, do short hill repeats. 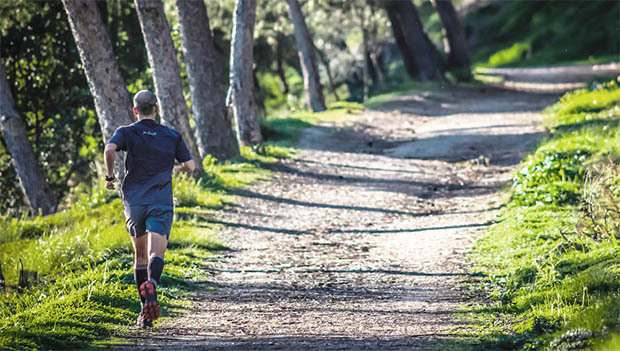 I like hill reps to be done on a soft surface like grass or dirt, if possible. One example workout is to jog to your local park as warm-up. Find a nice hill that takes about 20 seconds (or more) to run up. You can always cut the run part short and just turn around when 20 seconds is up. Do four to eight speedy runs uphill for about 20 seconds (or 20 steps is close enough), then for recovery walk downhill and take a short jogging loop before heading uphill again. Your total recovery time between each run should be around two minutes, give or take. When you begin doing these runs, build speed throughout the 20 seconds. As you gain speedy fitness, you can increase the overall average speed of each run interval. Pace is controlled throughout the workout – If you’re a person that has a tough time consistently gauging speed on the track, this is a huge advantage for you. Temperature is optimal – One issue with people who must do speedwork after work is that in the summer, it’s hot. You’re trying to do quality sessions in one of the hottest parts of the day and unfortunately, heat forces you to slow down. This is not an issue with an indoor treadmill session. The “track” is all yours – Sometimes at an outdoor track, other people can interfere with the quality of your workout, it’s generally not a problem on the treadmill. Before diving into the sample workout, begin by establishing your workout pace. I’ve found the best speed to start with is 8-percent faster than your open 10K time. “Open” means it is a run-only race pace and is not the run pace at the end of a triathlon. It is important to keep track of your speed and heart rate during an indoor track workout to make sure you are working at a tough (but not too tough) pace. Record the treadmill speed for each repetition of each set. Set your treadmill elevation at 0 or a 1-percent incline. Before beginning the run interval, note your heart rate (PreHR). Just know it will likely climb throughout the workout and that’s okay. At the end of each run interval, note your heart rate (PostHR). You’re looking for your heart rate to climb to the high end or just above lactate threshold heart rate by the end of the first repeat. As the set continues, you should notice that more time is spent above threshold. If the workout is impossible to complete, you started with a speed that is too fast. If you are easily completing the run times and your heart rate remains at or below lactate threshold heart rate, bump the speed up after the second run of the first set. Don’t go crazy with speed increases, go conservatively. One of the common mistakes people make at the track is doing repeats that are too fast and not sustainable. This puts you at risk for injury, and if you can’t complete the workout, the value is diminished. The treadmill helps you control speed. You can find more treadmill track workouts in my Intermediate Olympic Distance Triathlon training plans or in the book, Training Plans for Multisport Athletes. Give this workout strategy a shot and let me know how it goes. TrainingPeaks provides the complete web, mobile and desktop solutions for enabling smart and effective endurance training. Products include TrainingPeaks web and mobile platforms for athletes and coaches, Best Bike Split performance prediction software, and the new WKO4 desktop software for cutting-edge, individualized analysis. TrainingPeaks solutions are used by Tour de France teams, IRONMAN world champions, Olympians, age group athletes and coaches around the world to track, analyze and plan their training. Learn more attrainingpeaks.com.